The Revolution of 1917 was a culmination and a beginning; an old order was ended, a new one inaugurated. But the events were also an interruption. Economic achievement had been substantial before the First World War and was corroborated under the NEP. The social transformation initiated in the late Imperial period was resumed in the early 1920s. Both Nicholas II’s government and the Bolsheviks facilitated such modernisation. State economic intervention was not negligible before 1917 and it was massive thereafter. But the drive towards modernity was not generated exclusively by political action from on high. Society in general sustained the thrust towards change. By 1914, the tsarist authorities could no longer subject their society to anything near to close control. Only spasmodic repression was practicable. 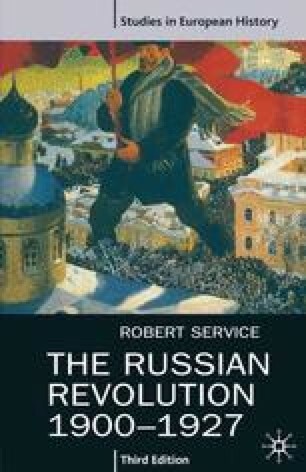 Thereafter even the Bolsheviks, although they amassed greater resources for coercion, met with resistance from sections of the working class and the peasantry in the Civil War. Concessions were inevitable by 1921. There were other continuities between the two regimes. Free political competition was absent from both. Abject poverty widely persisted. Ideological intolerance spanned the years before and after 1917. Above all, the country’s basic requirements were unchanged. In the first decade of Bolshevik rule, it remained as urgent to increase economic strength and military capacity as in the reigns of the last Romanov emperors. Although the vigorous pursuit of material progress produced positive results, it also accentuated points of weakness. Social tensions remained. Recurrent crises attended the economy, and agriculture in particular was susceptible to recurrent calamity.